Most Melbourne drivers are too young to remember life before power steering - cranking those great big steering wheels! It was a pretty good workout. Now power steering is standard. Let's look at how it works. The heart of any power steering system is its pump. The pump pressurizes the power steering fluid that provides assist for steering. Most pumps are driven by a belt that is run by the engine; a few are electrically powered. A high-pressure hose passes fluid from the pump to the steering gear. A low pressure hose returns the fluid back to the pump. These hoses can develop leaks, so it is a good idea for Melbourne drivers to have them inspected at every oil change. Low fluid can damage the power steering pump. That is why power steering fluid level is on the checklist for a full-service oil change. The fluid needs to be compatible with the hoses and seals, so check your owner's manual for the right type - or just ask your friendly and knowledgeable pros at Tuffy Tire & Auto Service Center Viera in Melbourne. The fluid cleans, cools and lubricates the power steering system. It breaks down as the years go by and collects unwanted moisture, so Melbourne drivers need to replace it from time to time. 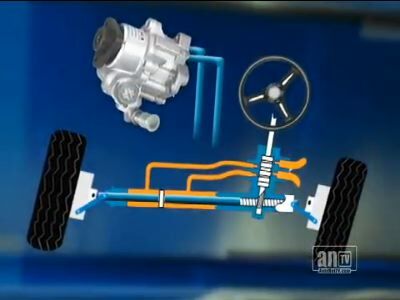 Many vehicle manufacturers specify power steering service intervals. Unfortunately, this important service is sometimes left off the car maintenance schedule for many of us. So, when in doubt, every 25,000 miles/40,000 km or two years is a good fallback. Your technician at Tuffy Tire & Auto Service Center Viera will use a detergent to clean the system, flush out the old fluid and replace it with the good stuff. Other steering components can be bent or damaged from wear or hard knocks: ball-joint, idler-arm, steering-gear, steering-knuckle and tie rod to name a few. Warning signs here are steering play, wandering, uneven tire wear and an off-center steering wheel. An annual alignment check at Tuffy Tire & Auto Service Center Viera in Melbourne will reveal bent or damaged steering components. The bearings should be cleaned and inspected. If they are excessively worn, they need to be replaced. The bearings are then repacked in clean grease. The team at Tuffy Tire & Auto Service Center Viera also recommends the wheel-seal be replaced when the bearings are serviced. Like everything else, check your owners' manual maintenance schedule. It's usually required around every two years or 40,000 miles/64,000 km. If you drive through water in the Melbourne area, the bearings will need service more often.